-30- :: Movie Information :: RabbitTV GO! A young girl has been lost in the city's flood drains and a storm is coming in. At the same time, the newsman's grandson is aboard an air force plane that is missing while attempting to set a record on a flight from Honolulu to Washington, D.C. Now, even as lives hang in the balance, these professional newsmen must put their feelings aside as they rush complete morning edition. Movies have long found a newspaper office to be a lively source of colorful characters and human drama - and it's ideal for the brisk style of Jack Webb (Dragnet). 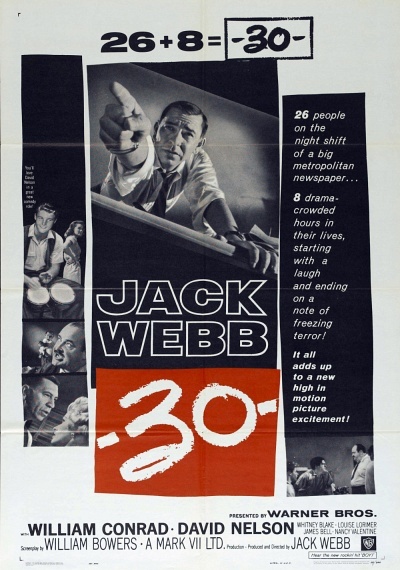 Webb leads the cast, playing the night editor of a big-city paper whose staff includes William Conrad, David Nelson, Joe Flynn and Richard Deacon.